Tony Salazar has a recipe for healthy, thriving neighborhoods. The ingredients may vary a bit from place to place, but the directions are always the same. 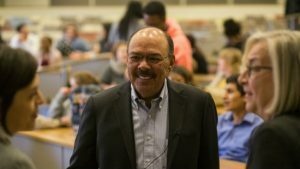 Salazar, a UMKC alumnus, is a successful real estate developer whose focus is on distressed urban neighborhoods across the country. But while the result of many urban developments is gentrification that drives lower-income residents out, Salazar preaches – and practices – a holistic approach based on mixed-income housing and mixed-use tracts. In many cases, it even involves mixed-use individual buildings. The result is stabilized neighborhoods in which newcomers blend with longtime residents, while people, local businesses – and the developer – all thrive. 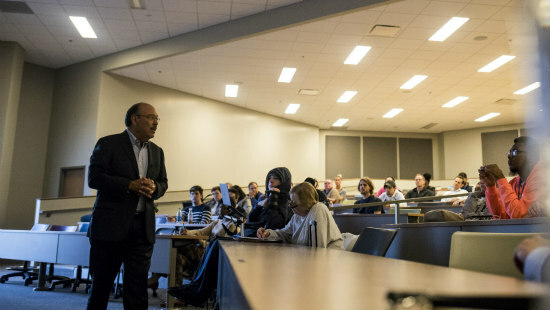 Salazar discussed his approach to neighborhood-building at the annual National Hispanic Heritage Month Lecture, co-sponsored by UMKC’s Latinx and Latin American Studies Program; Association of Latin American Students; the departments of Economics and Architecture, Urban Planning + Design; and numerous community partners. Salazar is president of west coast operations for McCormack Baron Salazar, a firm he co-founded. He was born and raised in Kansas City, and is one of 14 members of his family to hold UMKC degrees. The key to his approach, he said, is not to segregate people by race or economics. His multi-family buildings typically combine market-rate units with “affordable” units subsidized by a variety of government aid programs. Affordable units are not segregated to a single floor or wing, but sprinkled throughout the property. “No one knows who is affordable and who is market,” he said. Redevelopment of distressed urban neighborhoods must be a planned process, he said, and usually involving public-private partnerships. That way, the newly developed neighborhood will have all the necessary ingredients for success – anchors such as churches and schools, mixed-income housing, retail, transportation, open space and health care. “I dispelled the myth that people with different incomes won’t live together. It’s absolutely not so,” Salazar added. Economic segregation is a modern anomaly from most of human history, he said, driven by practices of the modern real estate industry. This kind of redevelopment require government to play a financial role, he said in response to an audience question about tax incentives. His projects typically are financed with a combination of federal housing grants, private investment and local or state historic tax credits.